Angels, mostly from the era of the Counter Reformation, proliferate in Roman churches. Before the glory of these freshly revealed frescoes, bright after 500 years of patina had been cleared away, John Paul articulated the amazement offered by a glimpse of the divine. Michelangelo’s hand had painted the frescoes, but his intellect had entered into the mystery of creation—not seen by human eyes—and he rendered the invisible visible. The master did something similar by evoking the Last Judgment on the chapel’s far wall, an event that has yet to occur. This thread of visualizing the invisible would become a central theme of the Counter-Reformation, in the Church’s efforts to highlight the invisible, efficacious presence of grace all around us. This presence is nowhere more evident than in the activity of angels, spiritual beings possessing no material bodies and yet integral to God’s plan for the salvation of the world. While the Protestant reformers never doubted the existence of angels—John Calvin duly noted that the Nicene Creed asserts the creation of things “visible and invisible,” while Martin Luther offered some lovely reflections about angels—still, among the reformers, speculating about the angelic nature was discouraged. Art found a particular role to play in the problem of rendering the invisible angels visible. Art’s capacity to embody and give visual form to ideas was one of its greatest strengths in this period. As Protestant reformer Henri Zwingli was moving towards the rejection of all images, Counter-Reformation Rome embraced art as a way to allow the faithful to see and meditate upon the invisible, in particular the angels. Angels proliferate in the Roman churches in apses, vaults, holy water stoops and frescoes—most of which come from the era of the Counter-Reform. One of the first great visual schemes of angels was in the church of Saint Mary Major, where in 1587 Pope Sixtus V made a miniature version of Michelangelo’s dome that he had just completed building at Saint Peter’s. The Sistine chapel in Saint Mary Major was intended as his burial chapel and he commissioned Cesare Nebbia to fresco the dome with illustrations of the nine choirs of angels. Nebbia’s spiritual messengers encircle the bronze tabernacle below, leading the eye upwards from the angels and archangels closest to the viewer, to the cherubim and seraphim who form a ring around the lantern and reveal God the Father at the apex. It was so successful that ten years later, Saint Peter’s dome would employ a similar design in mosaic. In the case of Sixtus’ chapel, the pope, a Franciscan, was underscoring the value of Scholastic theology. The chapel was built to also house the remains of Sixtus’ predecessor, soon-to-be Saint Pope Pius V, who had raised Saint Thomas Aquinas to the dignity of a Doctor of the Church. This extraordinary chapel, raised above a grotto where one of the earliest Nativity sets by Arnolfo di Cambio was placed, allowed the faithful to see the Incarnation below, adore the Eucharist which appeared to float on the shoulders of angels and then bask in the luminous choirs of heaven above. Saint Pius V (1566 to 1572), whose professed name was Michael, also took an interest in angels during his pontificate. His apartments in the Vatican are now part of the museums and contain the mosaic displays and Jan Matejko’s enormous oil painting of the Treaty of Vienna, but he also commissioned a little chapel, now used as a vestibule to the Sistine Chapel, where most visitors never look up to see Giorgio Vasari and Federico Zuccari’s cupola fresco, The Fall of the Rebel Angels. In this work, seven exquisite angels in pastel armor pose gracefully while skewering seven misshapen demons. Their wings suggest that these disfigured creatures were once angels, while now they are a mishmash of animal heads, tails and claws grafted onto what were once beautiful bodies. The base of the dome reveals a scorched cityscape, as buildings burn and crumble. The angels, however, come from the ring of light in the center of the dome where putti faces watch the ensuing combat. This fresco was more than a defense of Scholastic theology: Pius V excommunicated Queen Elizabeth for heresy, opposed the French Huguenots, gathered a fleet against the Ottoman Turks and resisted the internal pressures from Catholics who wanted to see the Church soften on doctrine in order to accommodate the new circumstances of the post-Reformation world. Pius responded to these challenges with the vigorous image of angels quelling rebellion, confident in serving the true light. 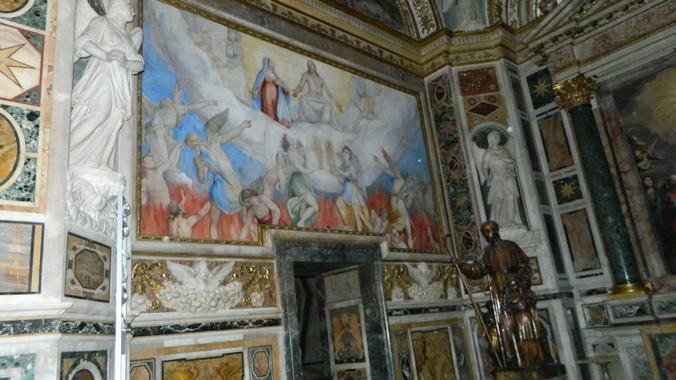 To heighten awareness of the role of angels, the Jesuits dedicated a chapel in the Gesù entirely to angels. The frescoes by Ventura Salimbeni start in the vault with Biblical account of angels: Tobias, Habbakuk, Jacob, but extend along the side walls encompassing the viewer with images of angelic intercession with Angels delivering souls from Purgatory and Angels taking prayers of the faithful to Heaven. The altarpiece, painted by the renowned artist Federico Zuccari shows the orders of angels in adoration before the Trinity. The entire chapel celebrates a hierarchy of intercession, where the angels play a fundamental role in mediation. A surround-sound space of angelic activity, past and present, in the story of salvation. Angels abound in the Eternal City whether as chubby putti gamboling in stucco or elegant marble creatures accompanying pilgrims across the Castel Sant’Angelo bridge to Saint Peter’s Basilica. Their proliferation during the Counter Reformation invited the faithful to engage with the invisible with the mind, the senses and especially the spirit.